I took like 40 pictures of them haha. 2 babies! They're uploading now! UP. LOAD. :-) We're all waiting!!! 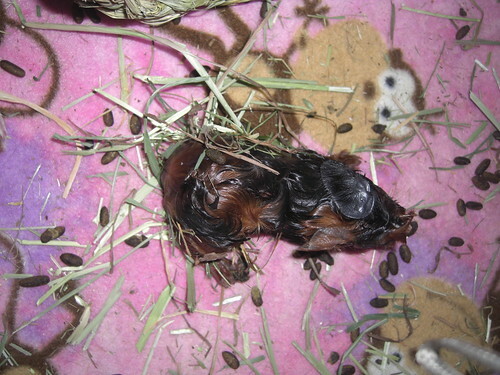 Bee1 weighs 89 grams, Bee2 weighs 127g. Tallulah was kinda running away at first, but when she hid in a box (ie. 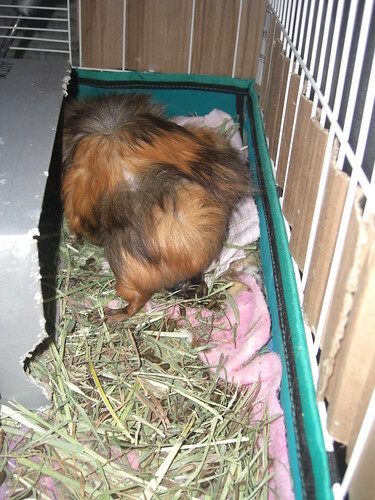 the knocked over hay box) I moved the babies in with her, she cleaned them and they appeared to be nursing. All seems normal and they are adorable little things!! Good weights! Make sure mom cleans them well, nurses and eats super well. I was nervous because the weights seem so drastically different, also, is falling over and shivering (from the babies) normal? 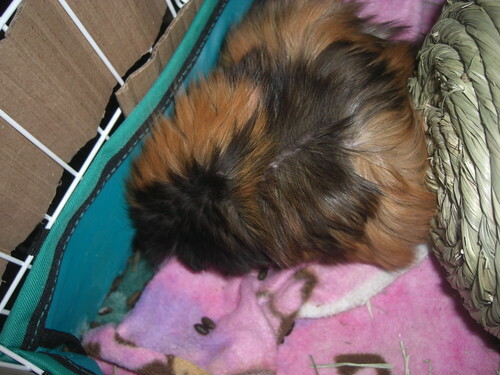 I just added more pellets and if Tallulah ever gets of the hay box I'll add some alfalfa hay. They are shivering because they are new and wet. 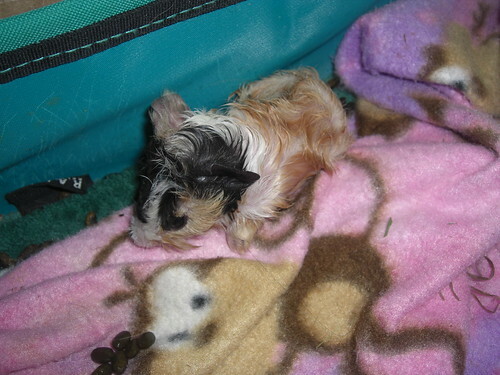 Make sure they have clean dry bedding to warm up in with mom. 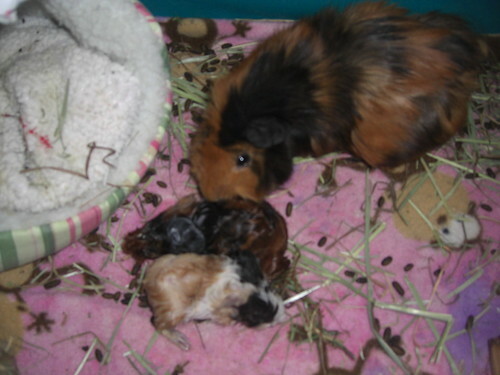 Since she is so young herself, it isnt unusual to have smaller babies. After all, where would they grow, she is tiny too!! That was pretty much what I was thinking, she's so small I was sure there could only be one in there! I'm going to move them onto the floor time pen so I can change out the bedding and such in a bit. Ditto LH. You might want to kick the AC up to, oh, say 73 or 74 for a couple of days (will save you some $ too). Try to make sure Bee1 eats and gains well (well, both of them and I'm sure you will). I have no direct personal experience with this but usually IIRC the larger one(s) are out first with the smaller to follow. Birth order may have helped Bee1 a bit here. Don't stress about the dirt. Give them a chance to warm up, dry off and nurse a bit first. Tallulah needs to get used to them too since she is so young herself. She chose the messiest place as her home base! haha They're all sitting in the hay box! Everyone says there's no mistaking the sound they make, and there really isn't! I've been checking on them all week whenever I hear any kind of funky noise, but when I heard the noise I knew what it was immediately! Also, Aunties are being super sweet and helped Momma clean them off! 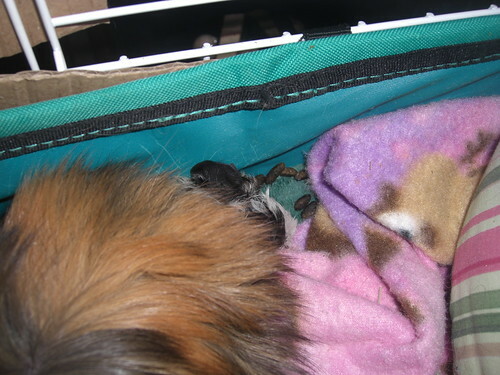 ETA: I put Tallulah's very favorite sack in there, she crawled in, I put the babies in, walked away, came back and all FIVE guinea pigs were in an ITTY BITTY SACK, so I removed the 2 aunties and put them in the 2nd sack, I was afraid they'd squish the babies! but I don't see how I can keep them from just running back in once I'm gone. I'm glad it went well. What a beautiful family. Keep us posted. I'm glad they're here! What a nice-looking family. Aw, they're all absolutely adorable. I'm glad to hear that the delivery went well, and even happier that they're here. Please keep us posted on their progress. They really are cuties. I'm glad all is going okay. Bee#1 is my fave at the moment. Congrats on the babies and safe delivery. Glad everyone is doing well. Finally! I'm happy that all went well and they are very cute. These things are so freaking cute!! Man, they motor! Bee2 is a talker just like momma and runs around tripping into food bowls making all kinds of noises haha I love them. Thanks for the good wishes! Everyone seems very healthy and active today! Just wait till you see a baby wash itself. It is so cute there aren't even words for it!